In Ancient Greece, decisions of any significance were guided by a mystical hand of divine origin. An oracle- a word derived from the Latin verb “orare” (to speak)- was in fact a person, priest or a priestess. It was thought that the very Gods themselves spoke through the mouths of these oracles. Different Gods spoke through oracles at different locations- Apollo at Delphi, for example. Oracles were consulted on matters of state, military operations, law, family, and personal matters. The prophesies and messages were mysterious and cryptic. Phrases which sounded poetic and profound were also vague, and open to interpretation. This oracle located near the town of Ioannina in Epirus is thought to have dated to as early as 2000 BC. In this sacred grove, the priests and priestesses would interpret the sounds of the rustling of leaves, or possibly bronze objects similar to a wind chime. Dodona was thought to have been originally an oracle of the Mother Goddess – often called Rhea or Gaia – and later Dione (“diety”), and then Zeus. Inscriptions on the temple mention both Dione and Zeus. 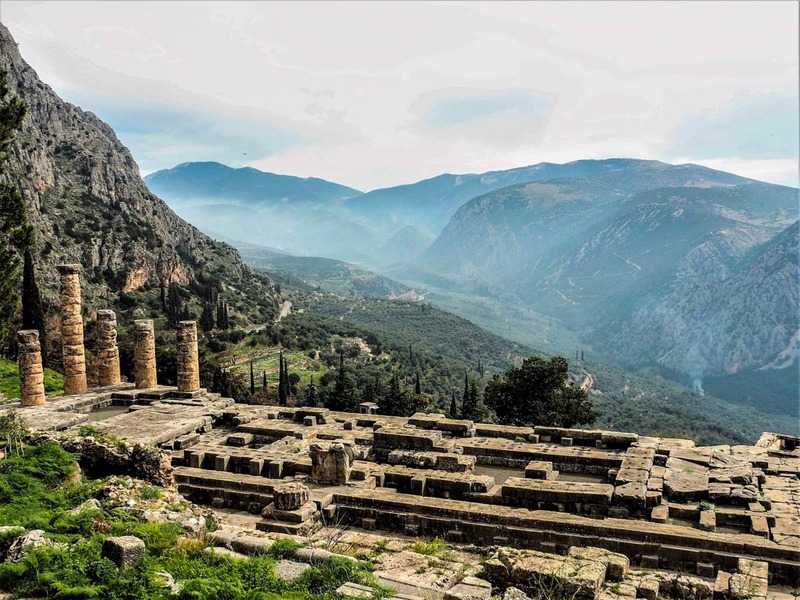 Although much less known today, the oracle of Dodona was second in importance on to the oracle of Delphi. It was indeed famed in its day. Odysseus, for example was said to visit Dodona, to ask whether he should return to Ithaca openly, or in disguise. 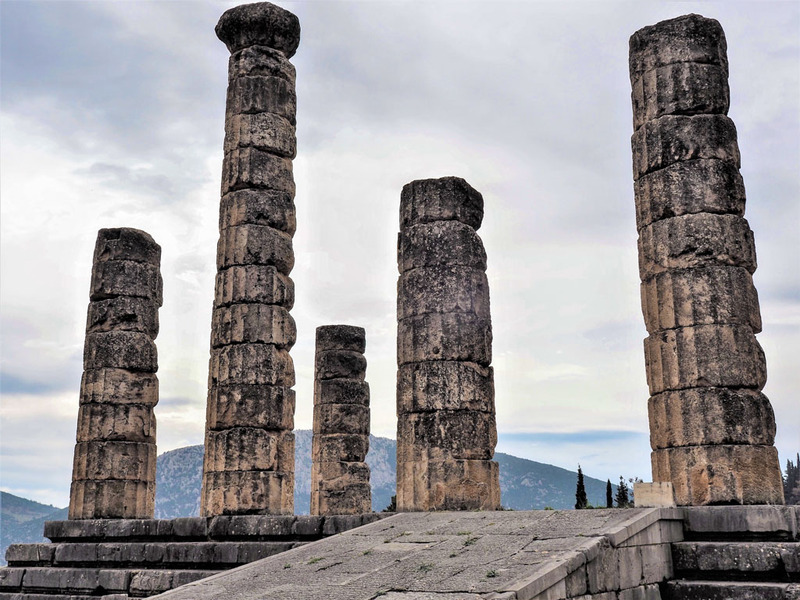 In the third century BC, King Pyrrus, ruler of the region, celebrated Dodona with the construction of a grand temple to Zeus, building a wall around the oracle and the holy tree with its rustling leaves, and building temples also to Dione and to Heracles. Athletic games and festivals of music and drama were also instituted. Dodona remained an important sanctuary until the 4th century AD, when the Christian emperor Theodosius banned all pagan religious activity. 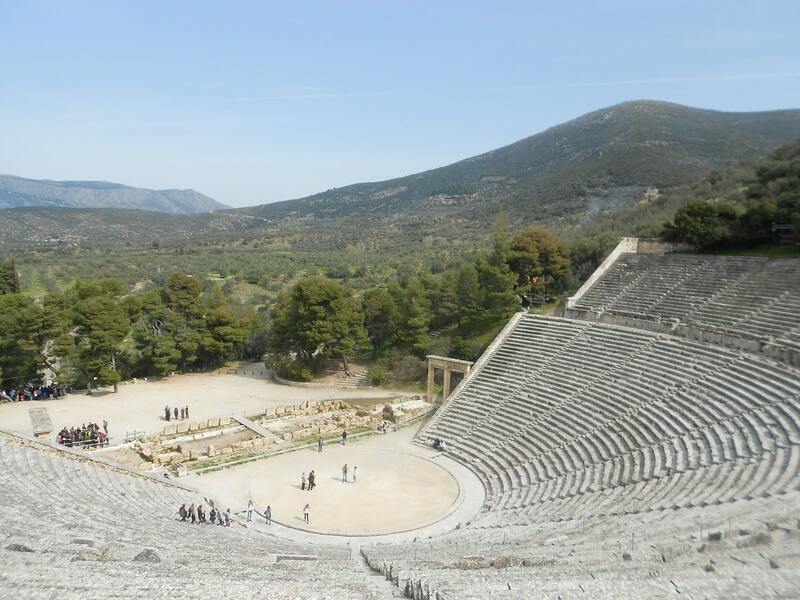 Today, Epidaurus is most famous for having one of the most beautifully preserved theaters of Ancient Greece. 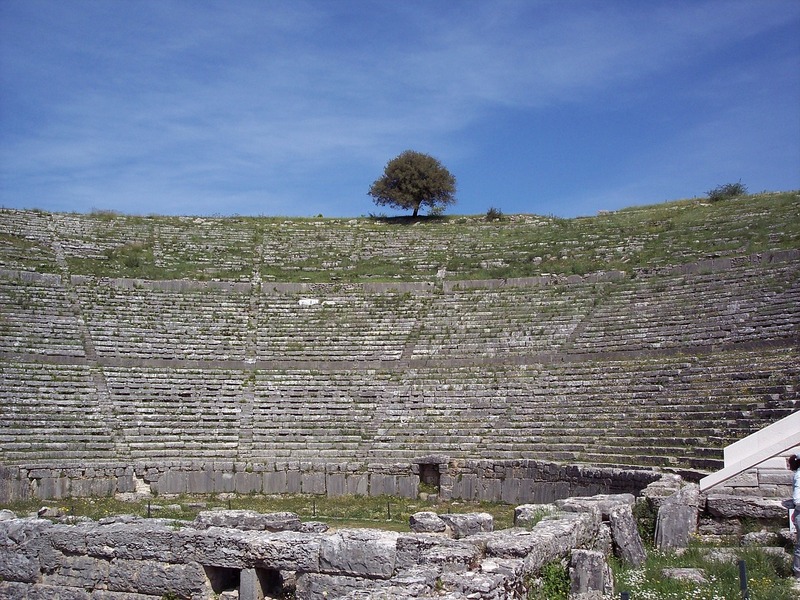 To see an Ancient Greek drama or comedy here is truly an experience you will never forget. But the theater is but one part of a major complex. Here was also the shrine to Asklepios, the God of Medicine. It was the center of the official cult of the city state of Epidaurus. Here, people sought physical and spiritual healing. There were many buildings in the complex. In addition to the theater, there was a Hestiatorion- a ‘restaurant’ for ritual banqueting, the Tholos (the great altar), and the stadium hosting athletic games. Most crucial for healing though was the Abaton. The Abaton- or Enkoimeterion- was a stoa where patients slept- not to rest, but rather to receive the divine wisdom of Asklepios. Rather than relying on an intermediary like a priest or priestess, Asklepios himself was thought to visit to the patients directly in their dreams, healing them. This was called ‘incubatio”- a ‘temple sleep’. The Asklepion at Epidaurus- perhaps best known today- was just one of many throughout ancient Greece. No Oracle was more famous than the Oracle of Delphi. Greek mythology relates that Zeus launched two eagles from opposite ends of the earth. Where they crossed would indicate the center- the ‘omphalos’ (naval) of the earth- which ended up to be Delphi. 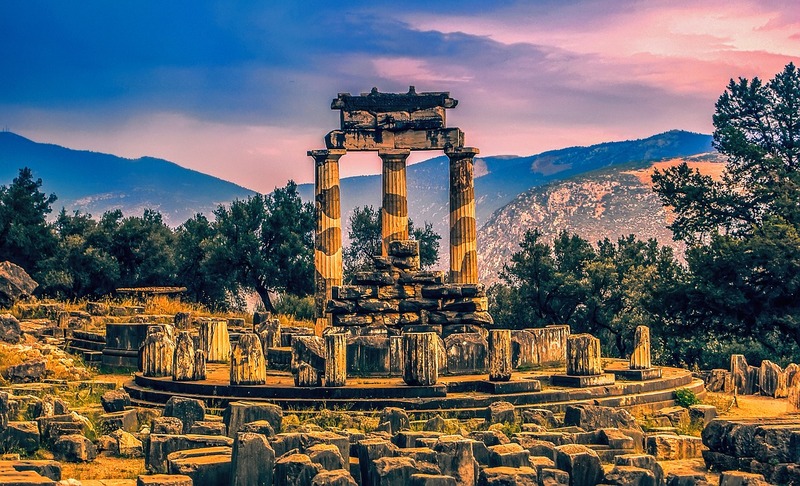 The Temple of Apollo at Delphi is one of Greece’s best known sites. Here you will see Doric ruins dating from the 4th century BC, erected on the site of earlier temples. This was an extremely important spiritual site in the ancient world. The oracle of Delphi was a high priestess, called the Pythia, the most powerful woman of the Golden Age of Greece (the 6th to the 4th century BC). She was pre-eminent among all the oracles of Ancient Greece, consulted before every major political or military decision. The Pythia was chosen from among the priestesses of the temple, all women native to Delphi, of excellent character and sober lifestyle. As many as three Pythia might serve at a time, alternating. It is amazing to imagine the scene: to receive the divine prophesies, the oracles would undergo a ritual purification, then bathe in a sacred Castillian spring. The oracle would then take her seat on a tripod, next to the ‘ophalos’, holding a bowl of water from the Cassotis spring in which to gaze. The oracle would then enter a trance-like state, sometimes frenzied. At the time, the explanation for the oracle’s divine inspiration was said to be sweet smelling vapors rising up from a fissure in the earth. This was dismissed in the modern era as untrue. But a team of scientists- a geologist, a chemist, a toxicologist, and an archaeologist found that through hidden faults, ethylene would have entered the chamber, producing a kind of euphoria. This scientific explanation makes the oracle no less fascinating though. The naval of the earth is also a fascinating window into the spiritual world of Ancient Greece. 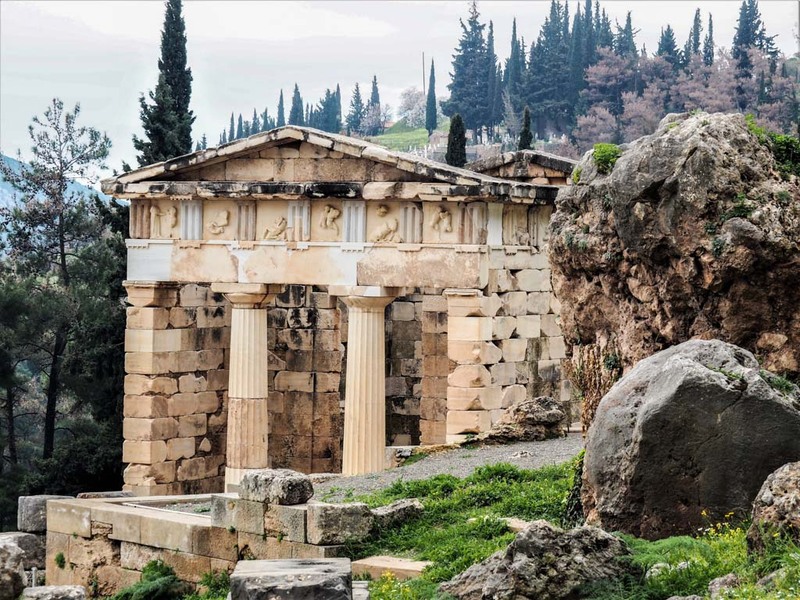 Have you visited any of the Oracles of Ancient Greece?